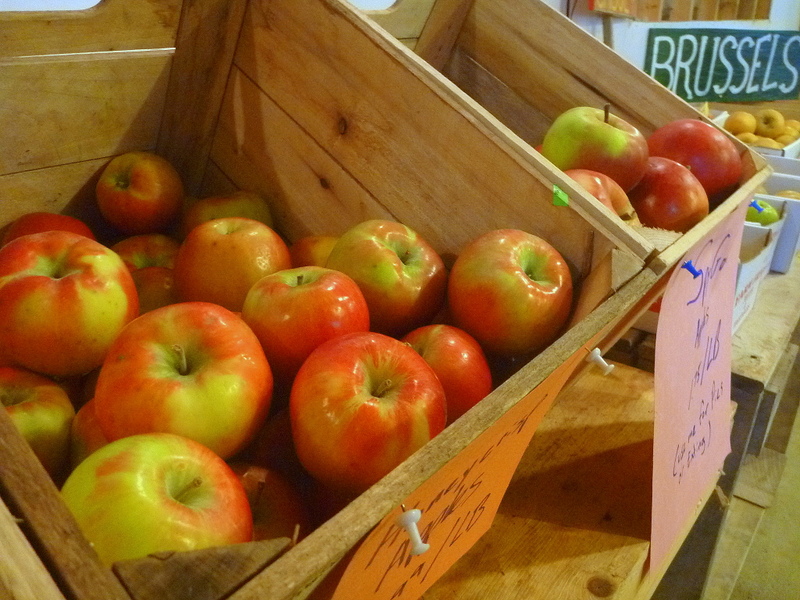 ← Fresh Local Fruits and Vegetables at Indian Creek Farm. Winter Things to Do… Ideas from You… and the Year in Review. HAPPY NEW YEAR, ‘CREEKERS. It has been cold and quiet here in Appleville. We are still open, believe it or not. If you want to help us make good use of the slow times, there are a few easy things you can do. But first, thank you for making 2013 our best year ever. They say, “No Farms, No Food.” But to our minds it is, “No Locavores, No Farmstand.” So, thanks. DRINK ORCHARD AMBROSIA. The Cidermeister is churning out FRESH presses of Indian Creek fruit. Nothing but apples and pears. We squeeze ’em, you drink ’em. If you buy a jug each week during this slow season, you will be a real old-fashioned country-style hero. 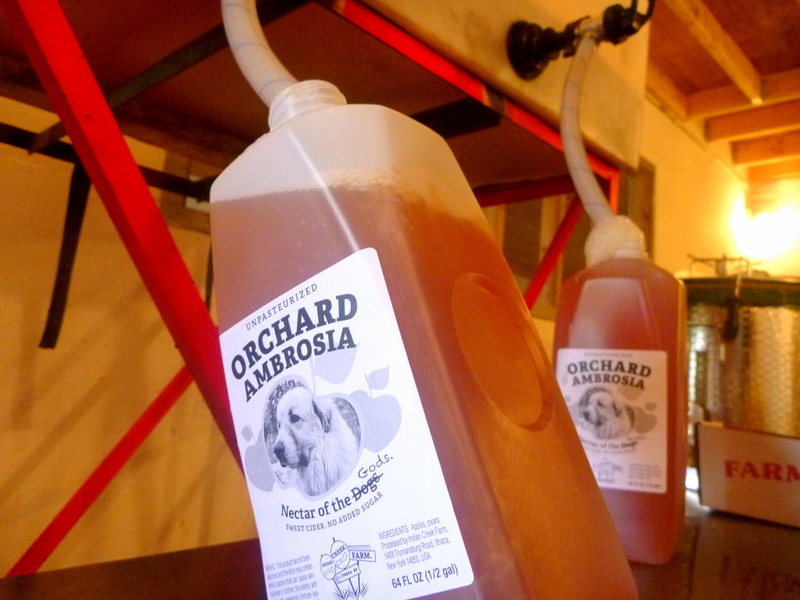 Winter Special: Get 4 gallons for only $5/gallon by calling the Cidermeister at (607) 793-3560. EAT APPLES. The stand is open EVERY DAY in self-serve mode, and some days you’ll find a real human poking around. We have Honeycrisp, Mutsu, Golden Russets, Newtown Pippins—the favorite of Thomas Jefferson—and other varieties from right here on the farm. Every few bucks that slides into the self-serve slot is a help in the winter, plus it’s kind of fun using the honor system. SHARE YOUR IDEAS. Winter affords us a few rare moments to act like civilized human beings—to LISTEN and THINK about how to make The ‘Creek even Creekier. Come spring we’re full tilt, so now is your chance to weigh in. Please use our special web form to share your thoughts. And now let’s indulge in a little revery: A buzz through the highlights of 2013. Lights at the end of the tunnel. It all began with blossoms. We invited everyone to bring their sneezes to The ‘Creek: Please Come Smell the Farm at Your Earliest Convenience. There was a pregnant lull while everyone waited for the first crop of the year. See Farm Kid Frolic, and Four Words About Strawberries. Soon enough, strawberries dominated the headlines with Find Your Thrill on Strawberry Hill… and 9 Rows of Strawberries… 1 Italian Wedding. By July we were singing Happy Berrythday, America, and Au Revoir, Les Strawbs. We were swimming in raspberries, and raspberries were swimming. Only a few weeks later, we were blessed with A Big Eggplant Sale, a Rare Plum Batch, and a Morning Hasselhoff. Then pickers tuned into our tutorial, How to Pick a Peach, and How to Avert Another Cold War, at the outset of a bountiful peach season. Weeks had passed with a mysterious lack of news about tomatoes. Then Eggder Furrow reported on How to Pick an Apple, and Something Kind of Amazing. By early September, having gorged ourselves in the peach orchards, we were Crossing Bartlett Bridge: Last Call for Peaches and Pears! High apple season kicked into gear, and we announced the event of the year: A Profusion of Pickable Apples, and Particulars on the Pigs Party. In October, fall arrived with apple cider donuts and a treat for students: Apple Picking, Pumpkin Patching, and a Special Deal for College Students. Next we shared photos of the Pigs-n-Apples Party, and some farmy new products, in Cider Sale, Honeycrisp Sale, Mini-Pies, and Apple Butter. We found last-minute inspiration with New Local Apple Gift Boxes… And a Warm Farm Weekend. Could this turn into an apple-of-the-month club? All too soon we were sliding into winter mode with our New Indoor Farm Stand… And that brings us full circle. Thanks for watching! Let’s hope 2014 brings good times like these. Please send us your ideas for next year. Meanwhile, be well. This entry was posted in Crop Alerts & Farm Buzz and tagged apples, country life, crops, Farm Life, Food Art, Food Photography, Food Writing, Fruits and Vegetables, Local Food, Photos, u-pick. Bookmark the permalink. 4 Responses to Winter Things to Do… Ideas from You… and the Year in Review. You should have an apple tasting event to raise money for the Tompkins County SPCA. Contact me for more information about how to get connected with the SPCA. Great idea, Pamela. Let’s talk in spring. Send us an email in May or so through indiancreekithaca.com/contact. Thanks, Sadie. Just when it seems like we should cut out the nonsense and send “normal” newsletters, we hear from someone like you. See you in spring.